The Power of More shows readers how to accomplish their goals, big or small. Whether you are a novice runner who wants to run a 10k race, a sales rep who wants to increase market share, or an elite athlete trying to conquer the world stage, you can achieve your ambition by believing in the importance of doing a little bit more. 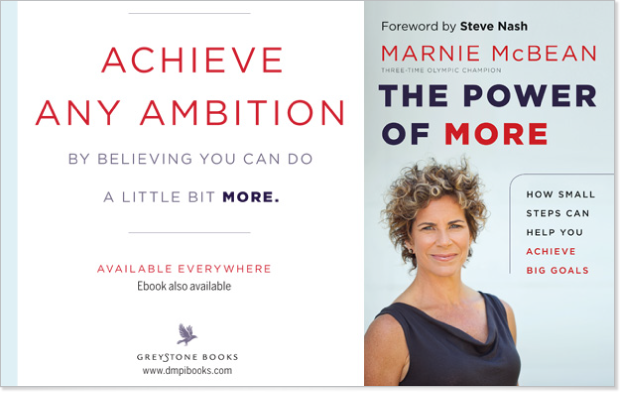 With humour and insight, three-time Olympic champion Marnie McBean discusses the importance of breaking big goals down into manageable bits of “more.” For example, when she decided to run to the top of the CN Tower in Toronto for a fundraising event, she focused not on running all 1,776 steps but on running up one step and then one more step. The Power of More is not about concentrating on the more you can get but the more that you can do. Even when you think you’re done, you aren’t—chances are you have a bit more to give. McBean discusses the importance of setting goals, the role of communication and teamwork, and the need for motivation, commitment, and accountability. Finally, while she encourages people to strive to be perfect she punctures the myth that we should expect to be perfect and stresses that both confidence and success are the result of preparation.